Mental Blog: 50th Anniversary of "Howl"
I regret to say that the line breaks are not as they were. Oh well. 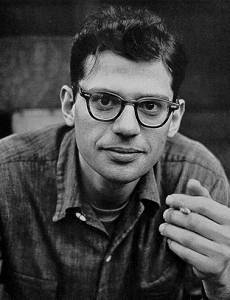 What did Ginsberg know of Lines? He was howling. His line breaks occurred when he ran out of breath. Referring to my previous posting about DH Lawrence: in his Foreword, he castigates the current (1923) crop of American writers. He says the earlier Americans (like Cooper, Franklin etc.) really were more original than those who came later, and insists that America has not yet produced its true voice. 1923, remember. Dos Passos didn't do it. Lawrence singles out Sherwood Anderson as someone who didn't do it. I don't think Fitzgerald did it. Thomas Wolfe certainly didn't do it. Maybe Hemingway. Not even Henry Miller, who I love (although not carnally.) But I think the Beats finally freed American literature. Kerouac's On the Road could not possibly have been written by a European about anywhere in Europe. Howl is without a doubt American thru & thru. As was the obscenity trial that accompanied it. The first reading of Howl at the Six Gallery poetry bash in San Francisco was a watershed event. An entire school of poetry & prose coalesced there. Kerouac described it. Others too. You wouldn't think a poetry reading would have such an impact on an entire culture. But that one did. It set the tone for a couple of generations (at least) of literary, musical, cultural and political rebellion and soul-searching and experimentation. Ginsberg howls now in heaven, dead. Safe in heaven, dead, as Kerouac would say it. All safe in heaven, dead. Living in the future electrons of this wobbly web. middle class! Holy the crazy shepherds of rebellion! Who digs Los Angeles IS Los Angeles! Click [a href="http://www.litkicks.com/People/CarlSolomon.html"]here[/a]for some background on the guy to whom Howl is dedicated. Schmitt! There's something not rite in the code for that link. So just copy and paste, OK? I can't fix it now without trashing the whole comment, Footnote and all. See, I have to make my own comments, cuz nobody else got nuthin to say. It's difficult to think of what to latch on to, what kind of comment to come up with... Lazy brain? Maybe it is a bit overhelming, like how to take on the whole society we live in? Larry, you are not only a poet, coverning large situations in simple sentences, you are also a man of weighing many facts and details... long broad symphonies versus simple melodies. Larry, you are great. But forgive the slow comprehenders,the ones that don't know how to, are slow or lazy to, respond. You have us thinking anyway. Don't stop. Rabbit. Holy Rabbit? Naw, not really. "Crunch, crunch, crunch, that's all folks!" You flatter me w.t., but I'm merely a dilettante pronouncing from on high...I'm a mile wide and an inch deep. Meanwhile, your Holy response is the best of all possible responses. Munch munch. I am trying to picture a Larry a mile wide and an inch deep. How tall would he be? He should grow with well deserved praise. Not shrink. A mile wide and an inch deep. That would make a long horizontal bar? I remember you once read a looooooong poem at the button factory. Your poem. Tons of political and social information in it, witty, disturbing, cross sections of life in general. And yes those are poems to read out loud. To engage the listening public, to experience instant response. It takes a special talent to write and present such stuff. Not everyone could do it. right? Ah your computer was in the hospital, being doctored and recovering. Being blocked from the blog world. But back in business now. I wish my cat Aries could be doctored to get better. But I am afraid she is dying. She is nearly 16 and it seems that her whole system is closing down. I am trying anti biotics for an infection in her mouth, gums and teeths. But I fear it is more than that and untreatable. My dear, black persian with her big green eyes, and attitude like the queen herself, looks diminished. Lots of grey in her face and coat and dull eyes. The joy and pain of caring for our pets.